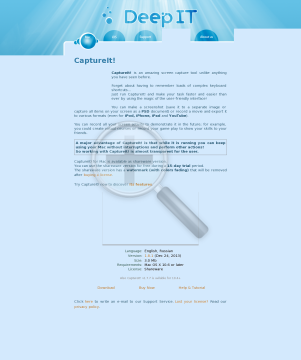 CaptureIt! is an amazing screen capture tool unlike anything you have seen before. Just run CaptureIt! and make your task faster and easier than ever by using the magic of the user-friendly interface! You can make a screenshot (save it to a separate image or capture all items on your screen as a PSD document) or record a movie and export it to various formats (even for iPod, iPhone, iPad and YouTube). You can record all your screen activity to demonstrate it in the future; for example, you could create virtual courses or record your game play to show your skills to your friends. A major advantage of CaptureIt! is that while it is running you can keep using your Mac without interruptions and perform other actions! So working with CaptureIt! is almost transparent for the user.